We voluntarily chose this land to live and lead our lives for generations to come. In my opinion, we should always remember our motherland, India, which gave us so much to grow. At the same time we should never ignore our adopted land, USA, where we take everything for granted. We enjoy earning our bread & butter in better living conditions. When I shared my thoughts and ideas of a Mahatma Gandhi Memorial with my fellow Board of Directors at the Indian American Friendship Council (IAFC), everyone concurred with my proposal and supported it to their fullest. On behalf of IAFC, I called for an all local India based community organization leadersâ€™ meeting on March 26, 2010 at FunAsiA, Richardson. When I presented the Mahatma Gandhi Memorial plan to the community at that meeting, not only did everyone unanimously support the project, they also ordered me to build a memorial for the whole community to feel proud. We initially approached the city of Dallas for the location but when their proposed site didnâ€™t suit our needs; we shifted our efforts to build the Gandhi Memorial in Thomas Jefferson Park in the great city of Irving. The whole community lauded our efforts and decision since the city of Irving is centrally located in the DFW metro area. While IAFC initiated this great project and pursuing efforts, as per the request of India Association of North Texas (IANT) leadership we joined hands and entered into a MoU with IANT there by forming Mahatma Gandhi Memorial of North Texas (MGMNT). It was a very easy decision and a natural alliance since Mr. Taiyab Kundawala, our IAFC Executive Vice-president, and I served in various positions including the Presidents of IANT in 2001 & 2002 respectively. It is a great honor and a special privilege for me to serve as the founder Chairman of the Mahatma Gandhi Memorial of North Texas (MGMNT). I sincerely thank my team members and the community for bestowing this responsibility with confidence on my ability to lead this project. I sincerely thank my fellow Board of Directors - Mr. Piyush Patel, Mrs. Indu Reddy Mandadi, Mr. Rao Kalvala, Mr. Taiyab Kundawala, Mr. Jack Godhwani, Mr. John Hammond, Mrs. Shabnam Modgil and Mr. Salman Farshori Board of Advisors - Mr. Ramesh Bhatia, Mr. Trammell Crow, Dr. Om Singla, Mr. Amir Rupani, Prof. Caroline Brettell, Mr. MVL Prasad, Mr. C.C. Theophine, Ms. Cindy Schwartz, Mrs. Marqueax Price, Mr. A.K. Mago and Ms. Pauline Medrano Fundraising Chairs - Mr.Sudhir Parikh, Dr. Srinivas Potluri and Mr. Kuntesh Chokshi Construction Committee Team - Mr. Thakor Seth, Mr. Manhar Meghani and Mr. Murtuza Tinwala Former Board of Directors - Mr. Dilip Patel and Mrs. Swati Shah besides several donors, volunteers and media who assist in making every event a grand success. My special thanks to Mr. Rao Kalvala who spearheaded the entire construction process in addition to spending umpteen number of hours day in day out. Once again, I take this opportunity to specially thank donors who opened their hearts and valets to support in a big way. Such donors are - Mrs. Kalpana & Mr. Ramesh Bhatia (Platinum); Mrs. Indira & Dr. Om Singla, Mr. Trammell S. Crow (Grand Benefactor); Dr. Chandra & Mr. Hirabhai Patel, Dr. Geetha & Mr. Paul Pandian (Benefactor). We can't undermine or underestimate the big help of in-kind donors who support the project to date - FunAsiA, Suraj Photo Studio, Sign Dada, Viva Railings, Weddings by Farah, TV5, TV9, TNI and Aina TV. Special thanks to Alsal Construction, Stone Carver Designs, City of Irving. I humbly request you all to spread the information about the memorial among your family and friends and encourage them to visit our proud Mahatma Gandhi Memorial Plaza. 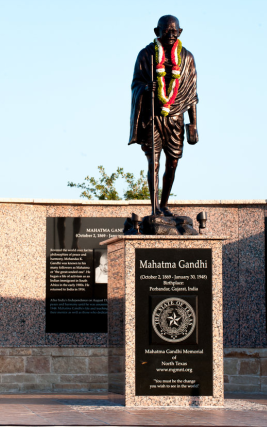 After the formation of MGMNT, with our persistent, dedicated efforts it took us four and half years to get all the needed approvals and permits from the city of Irving in March 2014, to build the existing Gandhi Memorial Plaza in Irving. Ground Breaking Ceremony of Mahatma Gandhi Memorial Plaza took place on May 3rd, 2014. We were honored to have Hon. Nikki Randhawa Haley, the first female and the first Indian American Governor of South Carolina State, as Chief Guest of Honor besides many other dignitaries at the occasion. The community active involvement and great support helped us to raise more than $800,000 and complete this project within a record breaking short span of five months. It was a proud and historic moment for all our Indian Americans during the unveiling of Mahatma Gandhi Memorial Plaza on October 2, 2014 Gandhijiâ€™s great-grandson Mr. Satish Dhupelia, made a special trip from South Africa to celebrate the 145th anniversary of his birth. We presented this memorial as an Indian American gift to the city of Irving to symbolize Peace and Friendship. This gesture brought our Indian community much closer to the mainstream. At this unveiling ceremony, it was heartening to see the representatives from families of Mahatma Gandhi and Martin Luther King Jr. beside many Corporate CEOs, policy makers from India and USA. We sincerely thank many India based community organizations, hundreds of donors, scores of volunteers and special thanks to Hon. Irving Mayor Beth Van Duyne and her staff for approving and giving us permission to build Mahatma Gandhi Memorial Plaza, which now stands as the largest Gandhi memorial in the USA. More than 200,000 vibrant Indian American community members of the Dallas-Fort Worth area comprisied of doctors, engineers, IT professionals, students, academicians, entrepreneurs, youth and senior citizens are now very excited to realize their dream of Mahatma Gandhi Memorial Plaza in the DFW metro area. Mahatma Gandhi Memorial turned out to be a unique landmark in USA. People from all regions, religions, and races like Indian-Americans, Asian-Americans, African-Americans, Hispanic-Americans and Jewish-Americans became part of our organizing committee and worked hand-in-hand to make the project successful. Our Annual events at this Mahatma Gandhi Memorial Plaza include-- â€¢	Indiaâ€™s Republic Day (January 26th) â€¢	Mahatma Gandhi Death Anniversary (January 30th) â€¢	International Yoga Day (June 21st) â€¢	Indiaâ€™s Independence Day (August 15th) â€¢	International Day of Peace (September 21st) â€¢	Mahatma Gandhi Birthday (October 2nd â€“ with "Gandhi Banquet" & "Peace Walk") and any other appropriate events. MGMNT Supported Activities in 2016 - â€¢	MGMNT supported and sponsored two University of Texas Arlington (UTA) students- Ms. Fatima Ayan Mallika Hirsi and Ms. Katelin T. Smith to attend International Conference on Gandhian Philosophy & Activities (ICGPA) at New Delhi, India on May 29, 2016. This event was coordinated by Dr. Ritu G Khanduri, Associate Professor of Cultural Anthropology, UTA. â€¢	MGMNT established the â€œMahatma Gandhi Fellowshipâ€� at UT Dallas, Richardson to support graduate fellowships. â€¢	MGMNT helped the victims of an accidental fire that happened on April 8, 2016 at Jefferson Ridge Apartment Complex, Irving across from Mahatma Gandhi Memorial Plaza. Iâ€™m pleased to announce that we have recently added a "Seating Area" with four park benches in front of the memorial and â€œPlant a Treeâ€� project donor recognition pedestal beside the plaza. This couldnâ€™t have been possible without many donors who came forward and contributed. We are planning for a second phase of expansion very soon and will reach out to you once again for your generous help.